If you watched my Snapchat last Tuesday, you saw my impatience with the slow cooker. I rarely ever use my slow cooker (I actually have two! ), but when I do, Igo through a range of emotions. First, I’m excited: Oh, I can’t wait to see how this turns out! Then, I’m impatient. After 10 minutes, I see that the timer still has over THREE hours left and I just think: When will this be done?! Finally, I forget about the slow cooker and I start doing whatever else I had to do and I go to check on the slow cooker and it starts to look more finished and the smells are delicious (I stick my nose real close and try to smell through the lid.) The excitement hits again and I think: Oh, this is going to be good! The final 30 minutes are always the toughest, because I just want it to be done. 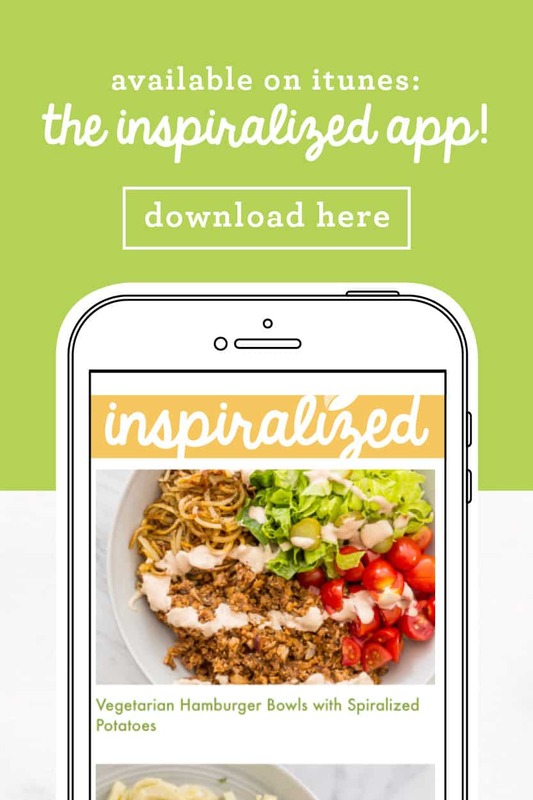 Luckily iwt this recipe, in the final 15 minutes, you prepare the rest of the recipe (the spiralized part), so it distracts you while you wait for the finished product. 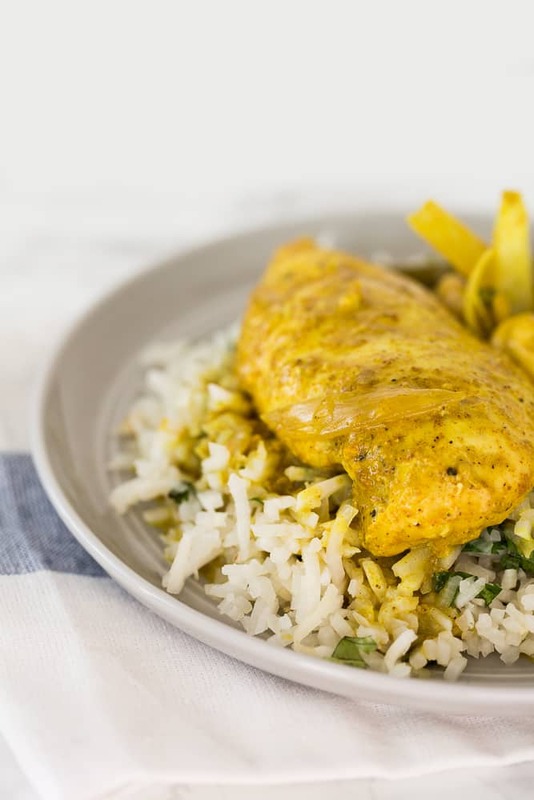 While this dish finishes in the slow cooker, you’ll be making your spiralized rice and cooking it, preparing it to be served with this unbelievably delicious coconut curry chicken. 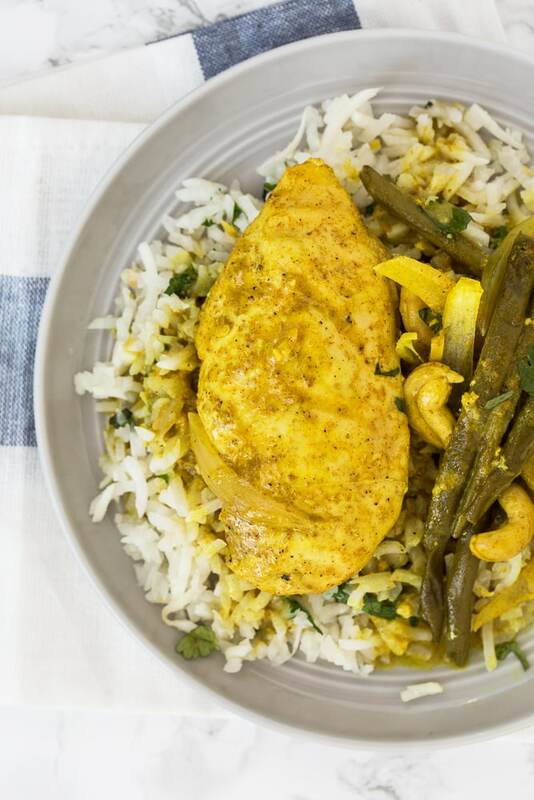 I was blown away by how flavorful this coconut curried chicken was. 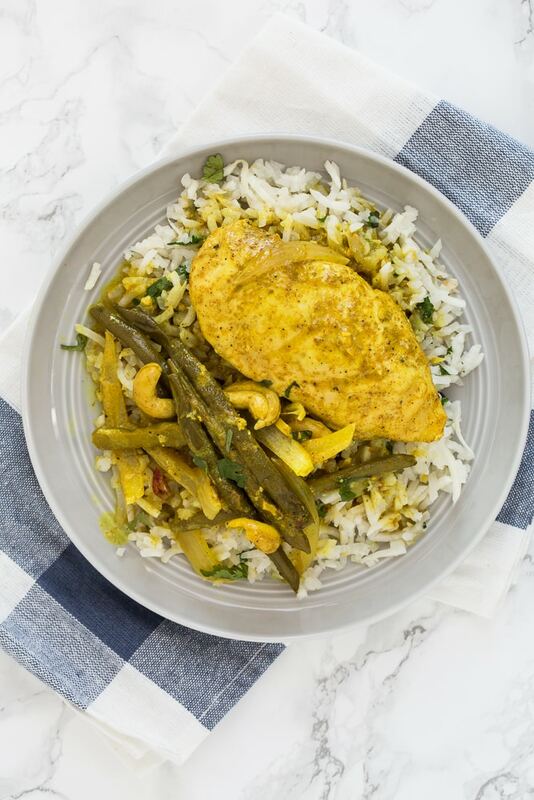 If you don’t like curry, I’d suggest alving the amount of curry powder but if you do like curry, you’re going to LOVE this recipe. 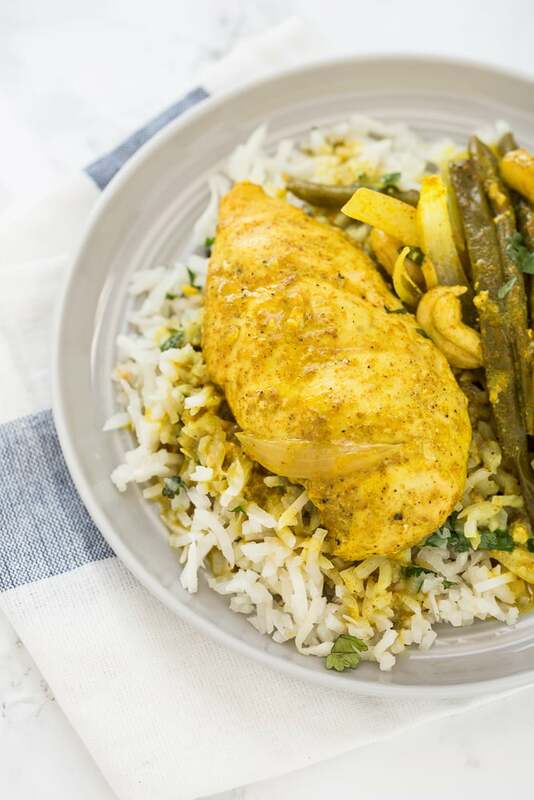 The turnip rice is the perfect flavor and texture to go along with this dish – it absorbs the juices from the curry and the bite of the green beans and onions combined with the soft chicken is wonderful. This is another great dish that can be prepared ahead of time – the turnip rice can be frozen, as well as the slow cooker part. What do you think? 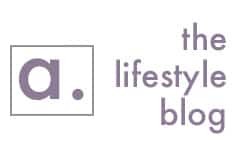 Would you like to see more slow cooker meals on the blog? 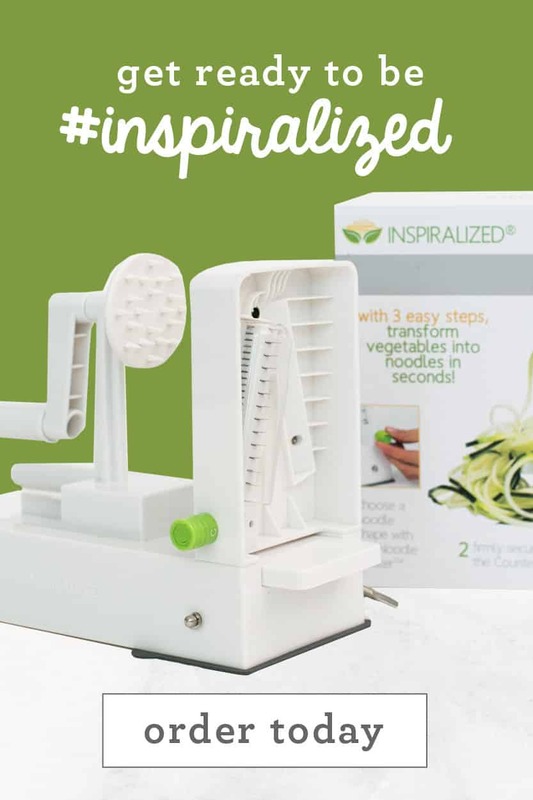 Enjoy 20% off the Inspiralizer® all week for Cyber Monday! No code required. Offer ends 11:59pm EST Friday, December 4th. *Prepare these ingredients once you press start on the slow cooker. Add chicken pieces, red peppers, green beans, garlic and onions to the slow cooker. In a medium bowl, whisk together the coconut milk, turmeric, curry powder, salt, and pepper. Pour mixture into slow cooker and stir to coat chicken and veggies. Cover and cook on high for 2.5-3 hours or on low 4.5-5 hours. Uncover, stir in the cashews, and cook another 15 minutes on low. Once you add in the cashews, prepare the rice. 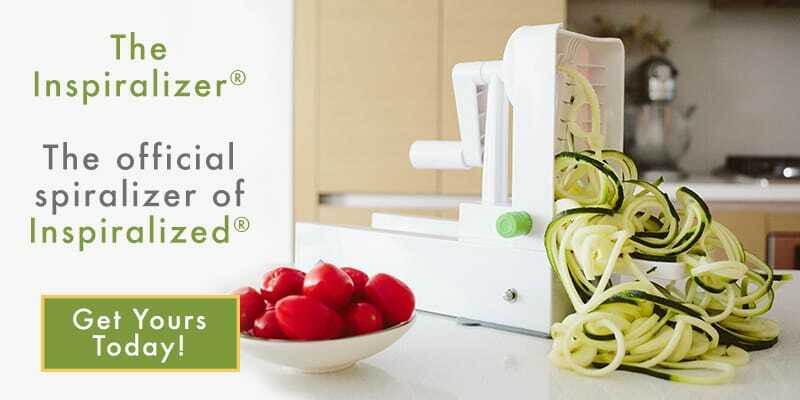 Peel and spiralize the turnips, using Blade D. Transfer the noodles to a food processor and pulse until rice-like and set aside. 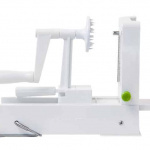 You may have to do this in batches, depending on the size of your food processor. Place a large skillet over medium-high heat and add in the oil. Once oil heats, add in the garlic and ginger. Let cook for 1 minute or until fragrant. Add in the turnip rice and season with salt and pepper. Let cook for 7 minutes or until turnip reaches your preferred rice-like consistency. When done, turn off the heat, fold in the cilantro, stir and divide into four bowls. Top each bowl with chicken, onions, green beans and ladle over with the sauce. Have you ever used an Instant Pot Pressure Cooker? An Insta Pot rocks! I did this recipe from nom nom paleo -- http://nomnompaleo.com/post/76137606724/pressure-cooker-mexican-beef and it was done in 2 hours and the meat was fall apart tender. I can totally see it over the turnip rice you have here! typo! 2 hours for stock, about 45 minutes for the mexican beef! 35 minutes to cook and 15 minutes for a 'cool down' to be able to open the insta pot! 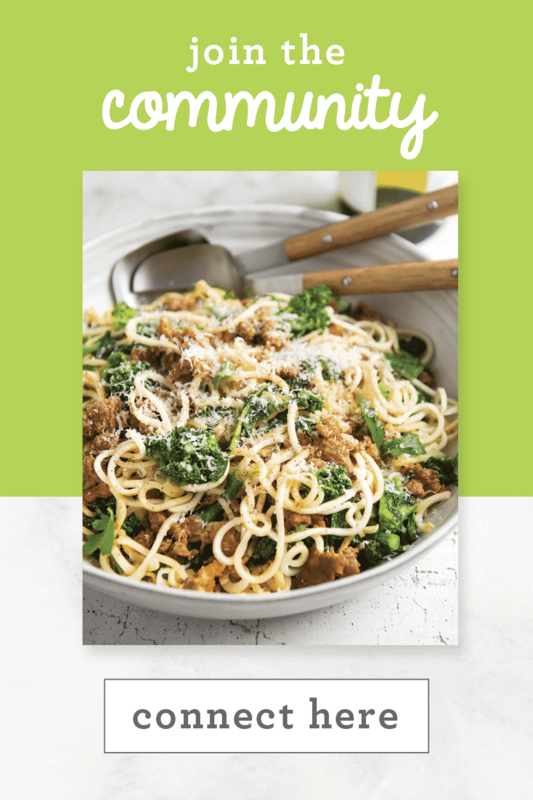 Yes please, I LOVE my slow cooker and am going to give this delicious recipe a try for sure. Any recommendations for the best slow cooker? I want to get one since I am seeing that it's making a huge comeback! I am guessing that the 3 chicken breasts get cut up into 4 portions at some point? That was a typo! It's 4 chicken breasts. Looks delicious and easy to prepare —what could be better? I've always loved slow-cooked meals but don't own a slow cooker, so I too would welcome any advice or recommendations for purchasing one. Meanwhile, yes, please: I'd love to see more slow-cooked recipes, as I'm sure they could be adapted to regular old stovetop techniques. I love my slow cookers (I have two) and as its now winter in the UK, it is so nice returning home from the cold to a hot nutritious meal. I will definitely be trying this recipe and would love to see more slow cooker recipes. A nice stroganoff with some sort of noodles perhaps? Thank you. Great idea! I am going to actually make this with my leftover turkey... so it will take even less time! I adore curries of all types and can't wait to try this! 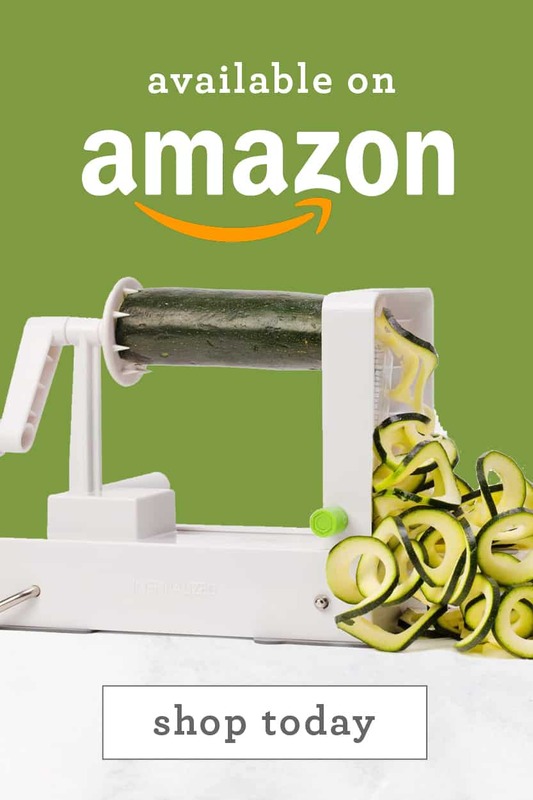 I have been spiralizing for about a year now, and have never done the ricing... I am about to try! This sounds soo good and wonderful for winter! It is going on the menu for this week. I would love to see more crock pot recipes -- I love my crockpot and would love to use it more! Definitely would like to see more slow cooker recipes! I use one all the time, they are so handy!! I love them because when I get home starving supper is ready and I don't end up eating something I shouldn't! Love slow cooker recipes. Can I substitute low fat coconut milk? 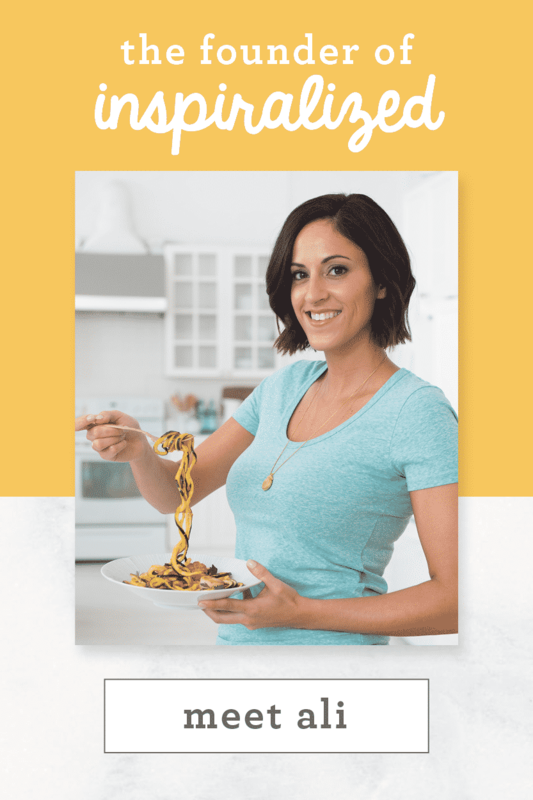 Definitely want to see more slow cooker recipes Ali!!! Hi. Making this right now, where does the turmeric go?? I think cauliflower rice will be an ok switch out for the turnips...can't wait to try! Loved this curry recipe, especially the turnip rice. I have tried making curry recipes with varying degrees of failure as they generally have all kinds of amazing spices and such and then come out pretty bland. My husband and I said that this was our final attempt at making a curry at home and if it didn't turn out I would leave it to our favorite curry restaurants in the future. Well, it was very good, very easy, and I was able to use my slow cooker which was a bonus. I added two potatoes and a handful of baby carrots as well, which increased cooking time. I will make the turnip rice with some of my favorite at home chinese and Thai recipes as well. Thank you. This is fantastic to hear, Lisa. Thank you so much for giving this recipe a try. We are so happy to hear that you had an easy, fun time with it. It's a great recipe for the winter! 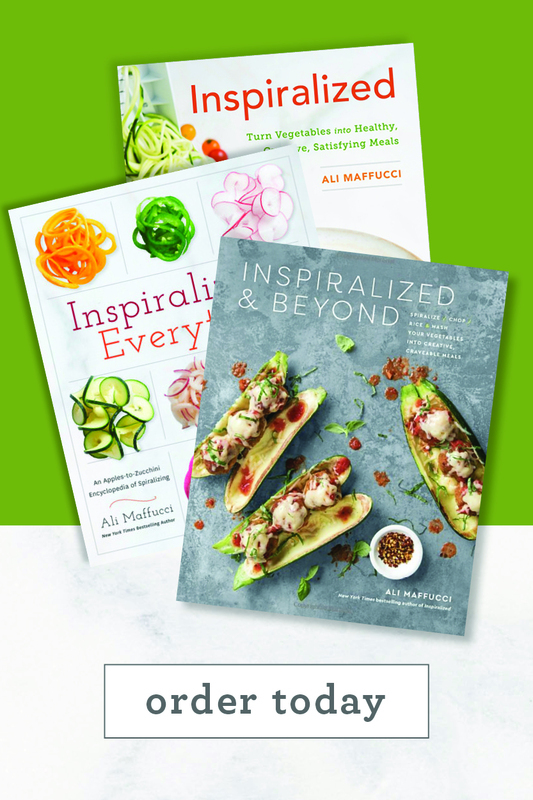 Let us know how those Chinese and Thai recipes turn out. Those will be great with the turnip rice. Yes yes, to more slow cooker recipes. They are the best when it's winter out and you have a crazy work schedule - there's nothing better than coming home when you're hangry and knowing that you DON'T have to cook. Quick question about freezing the turnip rice - do I make the rice in it's entirety and then freeze it, or do I just rice the turnip noodles, freeze that, and then thaw it out and add the rest of the ingredients in the last fifteen minutes? You can make it in its entirety and freeze it, definitely! I subbed chicken thighs (with bone but skinless) and baked covered in the oven at 375 for an hour. Didn't have a chili so used crushed red pepper. Turned out delicious and we loved the sauce. Didn't care so much for the turnip rice but glad we tried it anyway. Will do next time with cauliflower rice or quinoa. Made this tonight for dinner because we had to step out for a few hours ..so I slow cooked it while we were out and pre-spiralized the turnip. I subbed a jalapeño for the red chilli because that's what I had and it added a nice slow heat to the dish. Chicken was perfectly cooked but was missing something..so I ate this dish with maggi seasoning (essentially soy sauce) and it did the trick..it was delicious. The turnip rice was nice! Cooking it like that changes the turnip flavour for the better! I used my Instantpot and pressure no slowcooking. Start to finish 1 hour, proper curry we loved it! This is great information. Thank you for sharing! Fantastic flavors, fall-apart chicken for the win! Next time I'll definitely heed the note in the recipe about *making the rice in smaller batches* as my Blendtec was not having one big solid batch! My CrockPot slow cooker did the trick in 3+ hours-well worth the wait. Oh, and my boyfriend is eating turnips-will Inspiralized wonders never cease! Also pairs quite nicely with a chardonnay (Barefoot)-cheers! Haha! That's so awesome. You're so sweet. And thanks for your suggestions! This site is just awesome. I've looked these stuffs a whole lot and I realised that is good written, easy to comprehend. I congratulate you because of this article that I'll recommend to people friends. I ask you to visit the gpa-calculator.co page where each scholar or university student can calculate ratings gpa rating. Thank you!